"Where would I be without Textweek? Grateful every week for the quality anad clarity of support found here. Do you use Textweek weekly? Illustrated lectionary readings at Vanderbilt Divinity Library. Roman Catholic Lectionary Readings (NCCB/USCC) from the New American Bible. Episcopal Lectionary: BCP - RCL. Lutheran lectionary readings, Year C, from the ELCA site. Biblical Passages for Mennonite Bulletins, Year C.
Free Church version for Baptist, Reformed, and Congregational use Revised Common Lectionary Readings. ELCIC Worship Planning Calendar, lectionary citations with and without hymn suggestions, text and pdf formats. Lutheran RCL CEV readings - .doc files. Lutheran Bible Ministries. Textweek Blog and Facebook Page: The Text This Week, lectionary discussion & suggested articles on Facebook. Annotated list of "starting place" articles at ATLAS for this week's texts (includes direct links). Preaching This Week commentary, WorkingPreacher.org, Luther Seminary, 2016, 2013. 2010. The Center for Excellence in Preaching, resources from Calvin Theological Seminary: Comments & Observations, Textual Points, Illustration Ideas, 2016. "The Adventurous Lectionary," Bruce Epperly, Living a Holy Adventure, 2016. Preaching Helps and Worship Resources, Rev. Dawn Chesser, Taylor Burton-Edwards, Dean McIntyre, Prayers, Lectionary Hymns, United Methodist Church General Board of Discipleship, 2016. Pulpit Fiction, with podcast. Reflections of lectionary text, pop culture, current events, etc. Robb Mc Coy and Eric Fistler, 2016. "Caring Neighbors," Kathryn Matthews, Sermon Seeds, UCC, 2016. Lectionary at Lunch: MP3, Windows Media, and Real Audio files of lectures by professors at Concordia Seminary, St Louis, MO (LCMS), 2016. This Week at PreachingIllustrations.com, 2016. Social Justice Lectionary, Bruce Sweet, 2016. Starters for Sunday. Thoughts on Readings, Prayers & Hymn Suggestions. Office for Worship, Doctrine and Artistic Matters, Church of Scotland, 2016. "A Neighbor is Onoe Who Nurtures the Wounded Enemy," D Mark Davis, Left Behind and Loving It, 2013. The Lectionary Lab, Pentecost +8, the Rev'ds Dr. John Fairless and Delmer Chilton (aka "Two Bubbas and a Bible"), 2013. Lectionary Lab Live podcast. Evangelectionary for Sunday, July 14, 2013. Heather Lear, Evangelism Connections. Prophet, Pastor, and Provocateur, Bruce Epperly, Living a Holy Adventure, 2013. The Deployment of Good Samaritans, John Jewell, Lectionary Tales, 2013. Process and Faith Lectionary Commentary, Mary Ricketts, 2013, "...bringing process-relational thought to people of faith." Girardian Reflections on the Lectionary, Proper 10, by Paul Nuechterlein & Friends. Jesus Now, Proper (Ordinary) 15C. Lectionary, study and worship resources from Faith Futures Jesus Then & Now. Recommended articles from ATLAS, an online collection of religion and theology journals, are linked below. ATLAS Access options are available for academic institutions, alumni of selected theological schools, and clergy/church offices. Annotated list of "starting place" articles at ATLAS for this week's texts (includes direct links). Sermon Brainwave, Lectionary podcast featuring Profs. Rolf Jacobson, Karoline Lewis, and Matt Skinner, discussing the week's passages in light of current events. At Luther Seminary's WorkingPreacher.org. 2016. "The God We Didn't Expect," David Lose, in the Meantime, 2016. "Good Samaritan, Bad..." discussion and commentary, RevGalBlogPals, 2016. The Need for Nearness, Karoline Lewis, Dear Working Preacher, 2016. "Pushing Boundaries in a Culture of Outrage," Julian DeShazier, ON Scripture. Video, discussion questions. "Who Is the Samaritan?" Peter Lockhart, A Differernt Heresy, 2016. "Go and Do Likewise," Debie Thomas, Journey with Jesus, 2016. "Neighboring," Stephen Fowl, Ekklesia Project, 2016. "Lord of All," John W. Martens, America: The National Catholic Reporter, 2016. "Who Is My Neighbor?" Bob Cornwall, Ponderings on a Faith Journey, 2016. Preaching Tip of the Week, Bob Eldan, preachingtip, 2016. "Suprised by Love," David F. Sellery, 2016. "The Neighbor: Proximity or Affinity?" Robert Warren, Prospect, Christ Church Clermont-Ferrand, 2016. Sermon Prep and Lectionary Prayers for the Eighth Sunday after Pentecost, Year C, Michael Anthony Howard, The Pacific Pilgrim, 2016. "Church and State and Amos," John C. Holbert, The Peripatetic Preacher, 2016. "The Politics of Asking the Right Question," D. Mark Davis, Political Theology Today, 2016. "Good Samaritan," Lynn Miller, celebrating our creative and living God by generating art and architecture resources for congregations and individuals. Art and Faith Matters facebook page contains additional resources. Lectionary Ruminations, John Edward Harris, Summit to Shore, 2016. "Faithful & Fruitful Folk," Sharron R. Blezard, Stewardship of Life, 2016. "Testing Jesus," Hannah Adams Ingram, Modern Metanoia, 2016. "When a Samaritan Helped a Jerk," Larry Patten, 2016. "Dancing Like a Samaritan," Andrew Prior, One Man's Web, 2016. The Reflectionary, children's activity / sermon illustration, scripture image and reflection, Fay Rowland, 2016. "Draughting Theology," Steve Pankey, 2016. Daily reflections and study for Sunday. Prison Lectionary (reflections by persons incarcerated in US prisons), 2016. "The Travellers Give Their Side of the Story," Andrew King, A Poetic Kind of Place, 2016. "Who's the Crazy One?" Scott Barton Lectionary Poetry, 2016. "Divine Legalisms," Thomas Beam, 2016. Richard Bryant, Food for Thought, 2016. Pray As You Can, Reflections, commentary, prayer, poems, etc., Kym Harris, Diocese of Rockhampton, 2016. Lectio Divina Podcast, Todd Spencer, 2016. Unfolding Light, Daily Reflections leading toward Sunday readings, Steve Garnaas-Holmes, 2016. Break Open the Word, Michael T. Hiller, 2016. One Little Word, David J. Risendal, 2016. Hitchhiker's Guide to the Bible, Andy Doyle, Episcopal Diocese of Texas, 2016. The River of Life, Loddon Mallee UCA Presbytery Blog, 2016. Sunday's Child, Daily Lectionary and Reflections on Scripture and World, Una Malachica, 2016. Kairos CoMotion Lectionary Dialogue, Wesley White, 2016. Living the Lectionary, Daily RCL reflections, Pr. Phil Heinze, Fort Worth, TX, 2016. The Preacher's Exchange - First Impressions and Homilias Domincales / Homilias Breves. Jude Siciliano, O.P., 2016. SacraConversazione, discussion of the texts in terms of traditions of interpreters, from a postmodern perspective, 2016. COSLC Grace Notes, Pastor Dan Bollerud, Christ Our Savior Lutheran Church, Anchorage, AK. Meditations & poetry, 2016. Lectionary Scripture Notes, Dr. Norman Beck, 2016. "When Robbers and Innkeepers Profit from Good Samaritans," the Rev. Brian E. Konkol, Faith Forward, 2013. "Good Samaritans All Around," Eric Barreto, ON Scripture, Odyssey Networks, 2013. "Who Is My Neighbor?" David Lose, Working Preacher, 2013. "Go and do likewise," Pentecost 8, Daniel B. Clendenin, The Journey with Jesus: Notes to Myself, Journey with Jesus Foundation, 2013. "Active Neighbors," Alyce McKenzie, Edgy Exegesis, 2013. "Preaching from Amos?" John Holbert, Opening the Old Testament, 2013. Pulpit Fiction, podcast. Reflections of lectionary text, pop culture, current events, etc. Robb Mc Coy and Eric Fistler, 2013. "You Know the Commandments," Rick Morley, 2013. Stewardship of Life, Sharron R. Blezard, 2013 will be posted during the week. Political Theology, 2013, will post a commentary during the week. David Sellery, 2013, will post during the week. Katie Munnik, Presbyterian Record, 2013, will post during the week. Michael Coffey, 2013, will post during the week. Ponderings on a Faith Journey, Bob Cornwall, 2013, will post during the week. Thomas Beam, 2013, will post during the week. "Who Is My Neighbor?" Janet H. Hunt, Dancing with the Word. "Are You That Guy?" Bruce Maples, 2013. Preacher's Study, Maylanne Maybee, the Associated Parishes for Liturgy and Mission, 2013. A Word in Time, Anne Howard, The Beatitudes Society, 2013. Lectionary Notes, Beth Quick, 2013 will post during the week. Care for Creation Commentary, Dennis Ormseth, Lutherans Restoring Creation, 2013. Preacher Rhetorica, Christopher Burkett, 2013, will be posted during the week. Ekklesia Project, 2013, will post during the week. A Different Heresy, Peter Lockhart, 2013, will be posted during the week. Lectionary Greek, Rob Myallis, 2013. The Worship Closet, Amy Loving, 2013. "Very Near to You," Suzanne Guthrie, Soulwork toward Sunday: At the Edge of the Enclosure, 2013.
Who Is My Neighbor? Steve Godfrey, Church in the World, 2013. "Neighbor," sermon discussion from Frederick Buechner, Frederick Buechner Blog. "A Desire to Help," Steve Goodier, Life Support System, 2013. A Thousand Words of Inspiration, Beth Scibienski, 2013 will be posted during the week. Lectionary Ruminations, John Edward Harris, Summit to Shore, 2013. Ponderings on a Faith Journey Bob Cornwall,2013, will be posted during the week. Lectionary Notes, Beth Quick, 2013, will be published during the week. Preaching Tip of the Week, Bob Eldan, preachingtip, 2013. Rick Fry, 2013, will probably post during the week. Desperate Preacher's Site: sermons, discussions, liturgical material and other resources. Sunday by Sunday, Reflections on Stewardship based on the RCL Gospels, Year C. Prepared by the Reverend Michael Pollesel, Stewardship Education Coordinator, Diocese of Ontario. "There Are No Bystanders," David Lovelace, 2016. "It Was His Own Dumb Fault!" by Michael Renninger. A Sermon for Every Sunday. Video sermons from America's best preachers for every Sunday of the Liturgical Year. "Have I Told You Yet Today That I Love You?" Deacon Sil's Homiletic Resources, 2016. Göttinger Predigten im Internet: Every Sunday Sermons based on the RCL by a team of Lutheran theologians/ pastors, 2016. "When Robbers and Innkeepers Profit from Good Samaaritans," Rev. Brian E. Konkol, Faith Forward, 2013. Yeah, I Know--I'm Just a Drunk," the Rev. Jonathan Currier, Day 1, 2013. "Paying the Price of Mercy," the Rev. Danae Ashley, Sermons that Work, Episcopal Digital Network, 2013. 8 Pentecostés, Propio 10 (C) – 2013 POR EL RVDO. ABEL E. LÓPEZ, Sermones que Iluminan. "Tell Me a Story," the Rev. Christopher Henry, Day 1, 2010. "How Not to Inherent Eternal Life," Alyce McKenzie, sermon series on Lukan texts, Patheos, 2010. 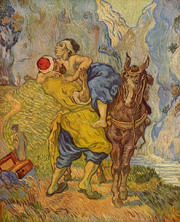 "Meeting the Good Samaritan," the Rev. Thomas G. Long, Day 1, 2007. "Caring Neighbors," Weekly Seeds, UCC, 2016. Proclaiming Faith, discussion, prayer, activities for primary grades, activities, 2013. Lesson Plans That Work, Adults, Year C, The Episcopal Church. Light on the Lessons, Lutheran Bible Ministries. .doc file leaders guide and participant guide for group study of the weekly lectionary readings. A list of links to on-line Bibles and general Bible study resources. A list of links to scholarly and preaching discussion groups and their homepages. A list of links to other lectionary-based preaching and worship resources. The Text This Week's Pentecost Resources Page. Ruach Words, Fresh Language for Worship, 2016. Life in Liturgy, Disciples of Christ, 2016. Taking Worship Home, Breen Sipes, Tri-Saints Lutheran Parish, 2016. Mustard Seeds, "Rescue / Mission Not Quite Impossible / Making a Positive Impact," Proper 10 / Ordinary 15, 2016. A lectionary-based ideas resource for leaders of contemporary worship, Ann Scull, Gippsland, Australia. Worship Resources, 8th After Pentecost, Rev. Mindi, Rev-o-lution, 2016. LCA Worship Planning Page, Pentecost +8, "Everything lay-readers need to prepare worship." Lectionary Liturgies, Thom M. Shuman, Presbyterian Church (U.S.A.), 2016. Worship and Liturgy Resources, Pentecost 7, by Rev David Beswick, Uniting Church in Australia. Laughing Bird Liturgical Resources, by Nathan Nettleton, South Yarra Community Baptist Church, Melbourne, Australia. Prayers, blessings, Eucharistic prefaces and scripture paraphrases. Resources: Based on the Revised Common Lectionary. Prayers, Collects and Litanies by Bruce Prewer, Uniting Church in Australia. The Billabong, Sunday 15, by Rev Jeff Shrowder, Uniting Church in Australia: Hymn suggestions and paraphrases of lectionary Psalms. Lector's Notes, Ordinary 15, Gregory Warnusz, Saint Jerome Parish, Bellefontaine Neighbors, MO. Notes and commentary for those reading this week's lectionary texts to the congregation. Thematic, Intercessory and Scripture Prayers for the RCL, Vanderbilt Divinity Library. Proper 10C, prayers and litanies, Katherine Hawker, Outside the Box. Confession RCL, Bill Wessner, 2013. Call to Worship, Mary Jane Konings, 2013. The Timeless Psalms: Psalm 82, Joan Stott, prayers and meditations based on lectionary Psalms, 2016. "Liturgy: prayer reflection", reflections on the collect at the Eucharist, NZBP. Rev. Bosco Peters, New Zealand. Common Worship CofE. "Empowered to Love and Speak Truth," rtf or pdf file of liturgy at Worship Ways. Sunday Prayer, Proper 10C, Mompriest, RevGalBlogPals, 2010. Commentary on collect for Ordinary 14, Bosco Peters, Liturgy, 2016. Art in the Christian Tradition, Jean and Alexander Heard, Vanderbilt Divinity Library. Creative Commons Attribution Noncommercial ShareAlike 3.0 License. HermanoLeón Clipart, Ordinary 15. Free clipart, backgrounds, slides, etc. Clip Art, Ordinary 15C, Fr. Richard Lonsdale, Resources for Catholic Educators. Clip Art Images: Luke 10:25-37, Luke 10:25-37, Misioneros Del Sagrado Corazón en el Perú. Images for this week's readings, Pitts Theology Library Digital Image Archive. Cerezo Barredo's weekly gospel illustration. Follows Latin American Roman Catholic gospel reading, though most gospels texts/themes are found in the index. Liberation emphasis. Parable of the Good Samaritan, audio telling, story in episodes, graphic, audio and written commentaries. Go Tell Communications, Biblical Storytelling for the Global Village, 2010. "Window Alarm," video, John Stevens, Dollar Store Children's Sermons, 2013. Church Galleries sample - free powerpoint download for this week's lectionary scripture(s). "Discerning Truth," Faith Element, 2013. Visual Theology, Faithful Images, Dave Perry, reflections and images usually tied to RCL texts. Agnus Day, Lectionary cartoon by James Wetzstein. "Let Justice Flow," original hymn by Jane Parker Huber and David Ourisman, based on Amos text for Proper 10. Hymns of the Spirit Three, Proper 10C, Richard E. Hurst, Universalist National Memorial Church. "Plumb Line," Brenton Prigge, NewHymn. Psalm 82 set to Tallis' Canon (LM), Psalm 25:1-10 set to Martyrdom (CM 86 86) by Dale A. Schoening, Metrical Psalms. Hymn and Song Suggestions, Proper 10C, 2016, annotated suggestions from Natalie Sims, Singing from the Lectionary. You Call That Church Music? alternative music planning blog for church musicians following the RCL (with videos), Ann Strickland, 2013. Worship Resource Manual, The Moravian Church, Southern Province. Worksheets for planning music in worship: hymns, anthems, solos, organ repertoire suggestions for RCL texts. Direct link to Proper 10. Hymn selections (United Methodist) and more from Hymnsite.com. Choral Anthem Project, Ordinary 15C, National Association of Pastoral Musicians. Sing for Joy, Lectionary 15, 2007. Choral reflections on this week's lectionary readings, St. Olaf College. Together to Celebrate, David MacGregor, Uniting Church in Australia. Contemporary Christian Music resources. Worshiping with Children, Proper 10, Including children in the congregation's worship, using the Revised Common Lectionary, Carolyn C. Brown, 2013. Storypath, Connecting Children's Literature with our Faith Story, Union Presbyterian Seminary, 2016. "Sermon of the Week," / "Mensajes para ninos," Sermons 4 Kids, Charles Kirkpatrick, Object Lessons & Children's Sermons, Coloring Pages, Puzzles. Sermons4Kids.com. Dollar Store Children's Sermons, John Stevens, 2016. "I Am the ...," On the Chancel Steps, children's resources by Frances Woodruff, 2013. Little People, Big Word, D Ditmer, 2013. Children's Sermon, Faith Formation Journeys, 2013, will be posted during the week. Lesson Plans That Work, Younger Children / Older Children, Year C, The Episcopal Church. Story for Children's Worship and Family Activity, Ordinary 15, at word-sunday.com: A Catholic Resource for the Lectionary by Larry Broding. Weekly Household Devotions, Faith Formation Journeys, 2013. CatholicMom.com: Coloring Page, Mass Worksheet, Crossword Puzzle, and Word Search based on weekly gospel text. Lectionary Puzzles, Proper 10/Ordinary 15. Word search puzzles in RTF or plain text, by Reg McMillan, St.Stephen's Presbyterian Church, Peterborough, Ontario.